Star Wars en Chine, je n'y crois pas. Le dernier film s'y est ramassé. Ce n'est pas une license qui a réussi à s'imposer là-bas. Pas encore du moins. J'ai l'impression que Marvel est TRÈS populaire en Chine, il n'y a qu'à regarder la foule et le nombre de fans pour l'avant première à Shanghai Disneyland (justement en plus ). D'ailleurs selon Wikipedia le film Avengers : l'Ère d'Ultron serait le 14ème plus gros succès au box-office Chinois (et Avatar est bien positionné en étant 17ème ). A rebaptisé "Solo, a Star Wars Story" en "Ranger Solo" en gomant toute référence à SW pour distribuer ce nouveau film là bas. 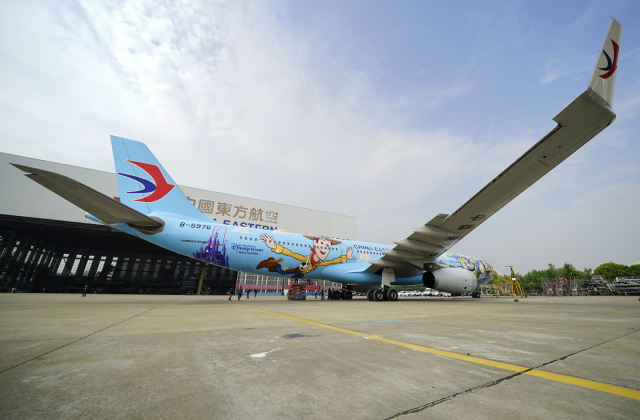 Shanghai Disney Resort and China Eastern Airlines launch immersive flight and airport experiences, giving guests a playful introduction and invitation to the new land. 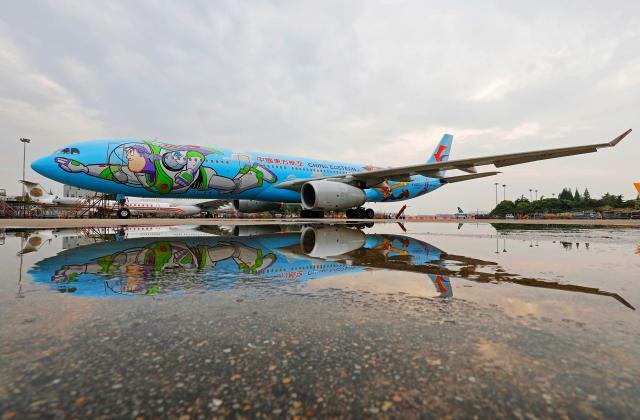 The first Disney•Pixar Toy Story Land themed plane took flight today following an unveiling ceremony at Shanghai Hongqiao International Airport. 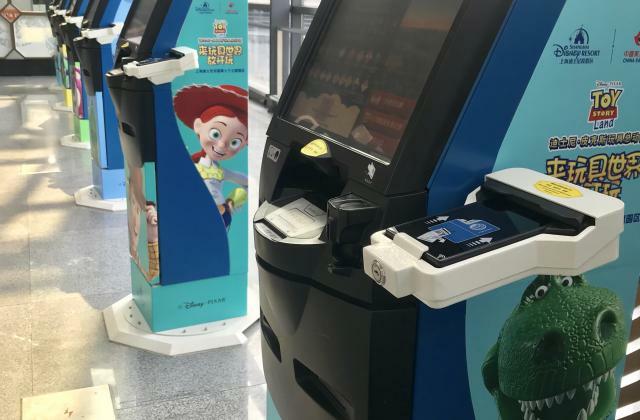 A series of themed flight and airport experiences were launched celebrating the grand opening of the seventh themed land at Shanghai Disney Resort on Thursday. 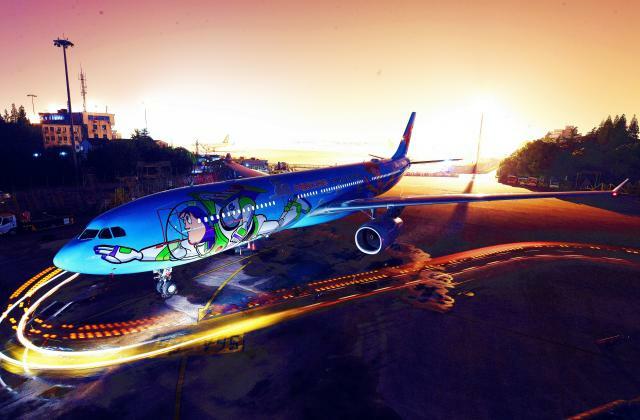 The celebration took place at the airport, giving invited guests a first look at the immersive décor and playful designs travelers will see as they arrive at the terminal. 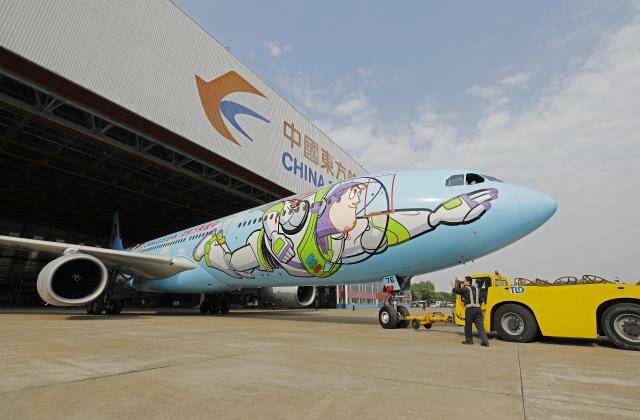 Executives from Shanghai Disney Resort and China Eastern joined together on the stage for a special moment to reveal the colorful new Toy Story Land themed plane to the audience. 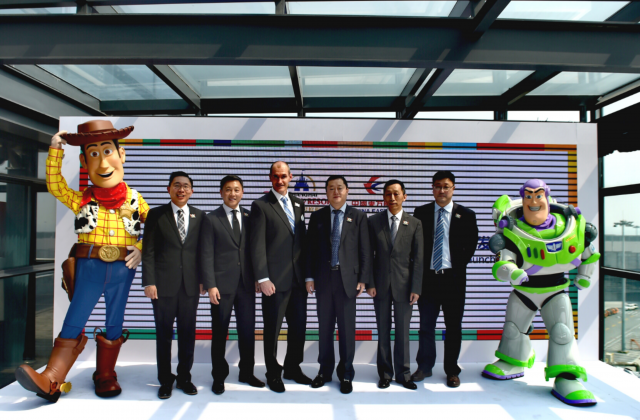 Characters from the Toy Story films, including Buzz Lightyear, Woody, Jessie and Lotso were on hand to celebrate the new plane. 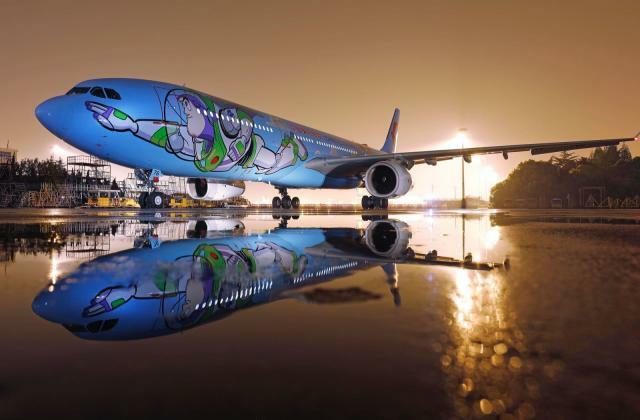 The exterior design of the plane immediately grabs the attention of guests with a giant Buzz Lightyear ready to fly off into the skies with travelers. 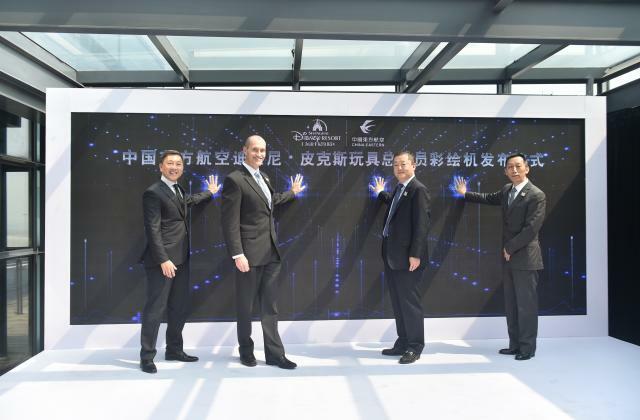 This flight brings a whole new level of entertainment to passengers, creating a one-of-a-kind experience for those flying to and from Shanghai. 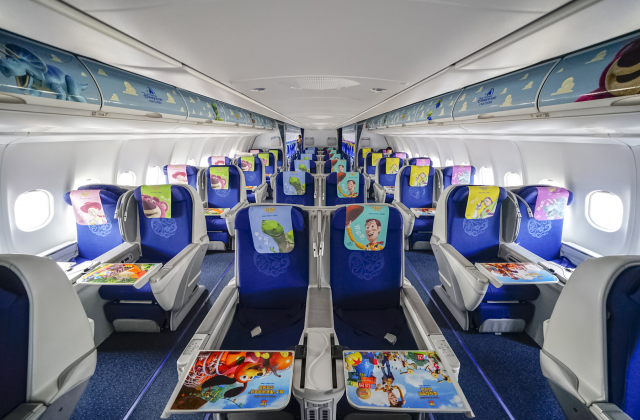 From the moment they are handed their commemorative flight boarding pass, to their first step inside the plane, passengers will be immersed in a playful toy atmosphere. 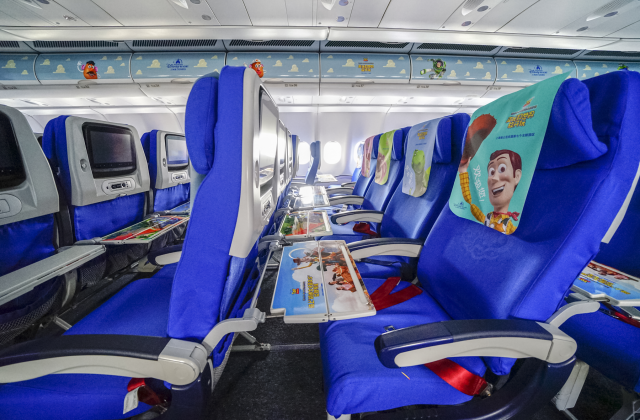 The in-flight entertainment and the oversized images of Toy Story characters in the departure terminal help bring Pixar’s classic storytelling to China Eastern passengers as part of an immersive full-flight experience. 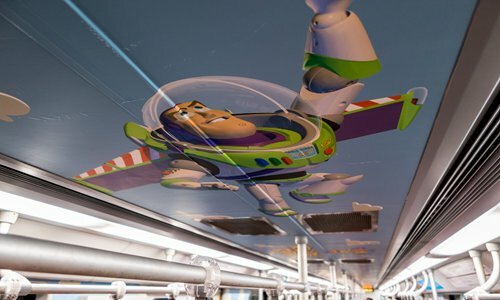 Imagery on cushion covers, luggage containers and the ceiling highlight popular characters from the Toy Story films. 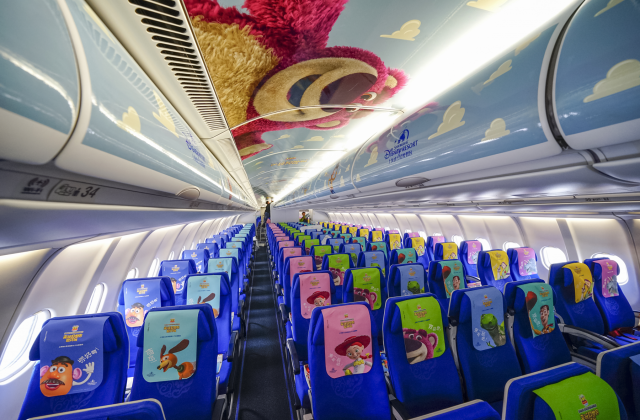 Colorful seatback tray liners illustrate the features of the new attractions, a television commercial further introduces the new land, and much more. Je trouve que le marketing autour du land est de "trop" par rapport à sa capacité. Cela sent l'anarchie ^^. overdose! overdose! Oh j'aurais trop la gerbe dans cette cabine d'avion!